The subsurface infrastructure plays a critical role in protecting public health and promoting economic prosperity of the nation. Largely out of right, it remains out of mind and its presence is felt only when failures occur. Less number of failures means better returns on the investment on such infrastructure and only way to insure it, is to standardize the construction process. 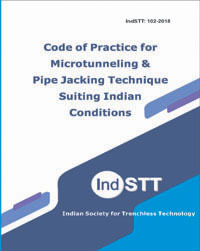 Code of Practice for Microtunneling Technique Suiting Indian Conditions has been developed with such objective & it aims at recommending guidelines for a safe microtunneling construction project. It is developed through the deliberations of the code committee of IndSTT with a view to Indian conditions. Microtunneling projects, which normally are design & build contracts, have many parameters impacting the project's output. Any unanticipated variation, in any of the parameters, may lead to partial or complete failure of project. Thorough designing & project evaluation, therefore, is more than important for a successful project. This document has been prepared with a view to provide the information about important & essential end conditions to the project executioner. Such conditions can never be complete and each project has to be evaluated in totality & the exercise needs to be done by specialists. The design prepared for the project subsequently has to be authenticated by site condition evaluation process & once the characteristics are clearly established, only then the project must be initiated. In addition, the constructor must be prepared for mid-course corrections in case of any malfunction or indication thereof. Failure to do so, naturally, may lead to enhanced difficulties and, at times, to complete project failure. The code aims to reduce such failures & therefore suggests some of the end conditions. User may also understand that project execution has to be done by experts only, as in-experienced workers may not be able to identify impending dangers & adopt necessary corrective measures in time. It is important that the professionals enaged must be adequately trained & experienced on the specific project work. It is expected that the code will be a helpful tool in the hands of such professionals. It would be able to assist the new-comers, to understand the nuances of the work, who subsequently can proceed to become processionals through more training & experience. As with all codes of practices, this would be reviewed and updated with the passage of time and the user/reader is invited to send their comment for further development of the code.